In China, trucks dominate the freight transport market and are increasing at a fast rate. In 2014, trucks moved more than 33 billion tonnes of freight in China. 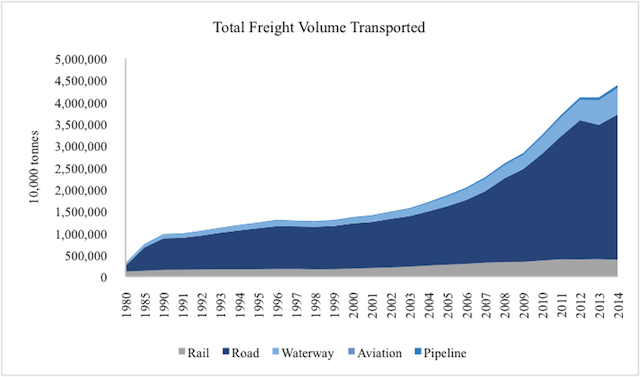 This accounted for more than 75 percent of total freight movement, which is 22 times higher than in 1980. As a result, trucks are the fastest-growing source of emissions from the transport sector. While freight trucks account for only 15 percent of the total vehicles in China (excluding motorcycles), they contributed to more than 50 percent of vehicle carbon dioxide (CO2), 35 percent of carbon monoxide, 41 percent of hydrocarbons, 68 percent of nitrogen oxides and 79 percent of particulate matter emissions in 2014. Road freight, especially heavy-duty trucks, are recognized as the most polluted mode of transport, contributing significantly to poor air quality. The World Health Organization found a strong link between air pollution exposure and public health. In addition to health implications, air pollution impacts the economy. In China, the total welfare loss due to outdoor air pollution was an equivalent of 9.9 percent of GPD. As a result, transport experts are trying to find solutions to achieve green, smart and inclusive freight transport in China. In addition to being the most polluted, road freight has the most unorganized market in China’s transport sector. According to China’s Ministry of Transport, the road freight market is challenged by “3 lows and 1 high:” i) low concentration, ii) low technology level, iii) low efficiency and iv) high fuel consumption. Low Concentration: Current trucking companies in China are characterized as “small, fragmented and weak.” More than 90 percent of the freight market is dominated by a large number of small companies with fewer than ten trucks; most of these small companies are “owner-driver” companies, and there were more than 6 million of them in 2015. The market is highly competitive, labor-intensive and not very profitable. Low Technology Level: China’s road freight sector has poor truck and facilities conditions, illegal truck retrofitting and a lack of standards, logistics information systems and intelligent transport systems. Low Efficiency: The average operational efficiency of road freight is lower than 60 percent, which is 33 percent lower than developed countries. In addition, road tolls are a major cost for trucking companies. Truckers have to choose less efficient routes in order to avoid excess road tolls. Additionally, excessive road tolls also contribute to overloading and oversized trucks. High Fuel Consumption: China’s truck fleet is not fuel-efficient; its fuel consumption is 25 percent, 20 percent and 10 percent higher than Europe, Japan and the U.S. respectively. In addition, most trucks cannot meet the required emissions standards. Due to the inherent challenges of the freight system in China, green freight was a major topic of discussion during the World Metropolitan Transport Development Forum (WMTD). On October 24 – 25, 2016, over 500 participants gathered in Beijing to discuss challenges and solutions for sustainable transport development. WRI China, Beijing Municipal Commission of Transport (BMCT), and Beijing Transport Institute (BTI) co-organized the forum, striving to encourage city leaders and transport professionals to address challenges in urban mobility. Multimodal Freight Transport and Transshipment: China should encourage more multimodal freight transportation, especially to improve the intermodal transshipment (moving cargo from one mode of transport to another) in logistics hubs to enhance the connectivity of rail, waterway/port, road and air. International experience shows that efficient multimodal operation can save around 40 percent of emissions. Internet Plus Logistics: The traditional places for transaction and information exchange cannot meet the requirement of today’s logistics market. More and more logistics companies are applying the “Internet Plus Logistics” concept and “Uber-like” apps, such as Truck Alliance, to do route planning and cross-docking. To enhance logistics efficiency, big data and the new information technologies will soon replace the traditional information platforms. Experience shows that internet technology can help reduce 30-50 percent of empty miles (distance traveled by trucks without loading any cargo) in China. Drop-and-hook (tractor-trailer): Drop-and-hook is a method to organize transport and trailer pool management to reduce empty miles and dwelling time (the waiting time for trucks to load and unload), and eventually optimize performance. “Drop” refers to delivering a trailer and dropping at the customer site (or a distribution center), and “hook” refers to immediately hooking up a loaded trailer and moving it to the destination. 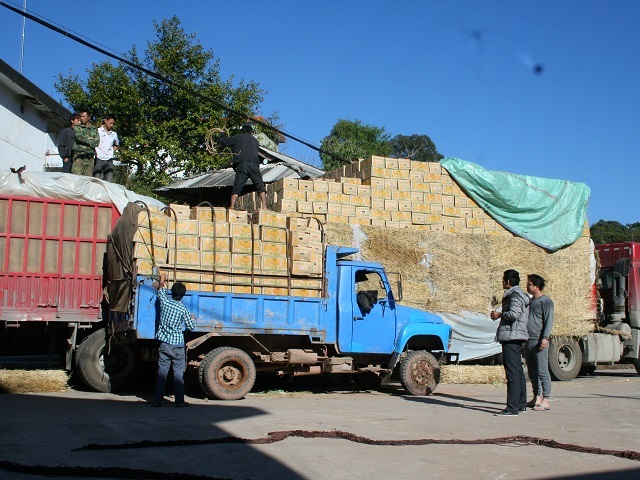 Evidence from Guangzhou trucking companies at the WMTD forum shows that drop-and-hook can save about 34 percent of logistics costs. New Energy Trucks and Clean Technologies: Most practitioners encourage new-energy vehicles and clean technologies. Electric trucks, which have reduced noise and zero tank-to-wheel emissions are especially suitable for urban deliveries with frequent stop-and-go conditions. Experience from the U.S. Environmental Protection Agency SmartWay Program shows that trucks can reduce 5-85 percent fuel emissions by using a combination of the verified clean technologies. Low Emission Zone and Emission Standards: China also needs to introduce low emission zones (LEZ) and enhance vehicle emission standards nationwide. According to WRI’s recent study, LEZs can reduce particulate matter and nitrogen oxides by 25 percent and 10 percent, respectively. Furthermore, introducing LEZs in 20 major Chinese cities can also reduce more than 100 million tonnes of carbon dioxide by 2030. A smart, green and inclusive freight market depends on the eco-efficiency of the logistics chain as a whole. Fortunately, China’s logistics stakeholders have already started to work together on establishing a green logistics industry. China Road Transport Association, the biggest transport association in China, has been conducting a China Green Freight Initiative in recent years, establishing a strong stakeholder network to promote green freight. China’s Ministry of Transport also identified green freight as a top priority in its 13th Five-Year Strategy on environmental protection for transport. The government intends for freight carbon dioxide emissions to decrease by 7-8 percent by 2020. Fleets will also meet even more air pollutant reductions in Beijing-Tianjin-Hebei, Yangtze River Delta and Pearl River Delta regions. As a result, China will have a more sustainable transport sector and a greener logistics market.